Antonio Nucciarone first appears in the Painesville, Ohio, area in 1903. 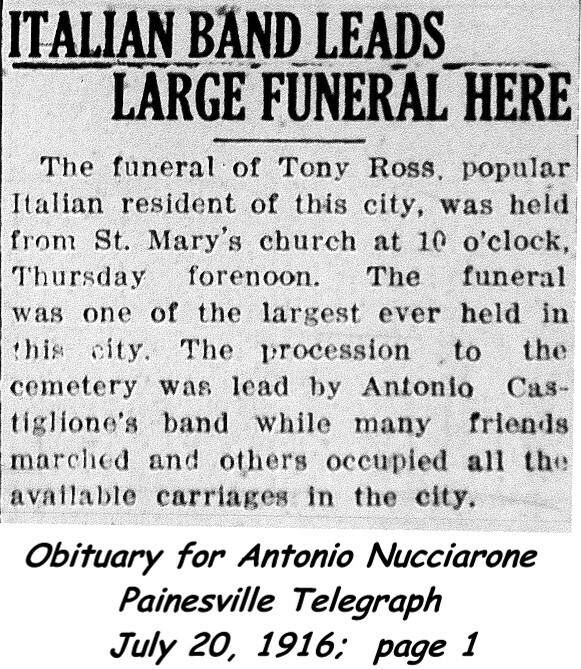 In America, Antonio Nucciarone was known as Tony Ross. Antonio Nucciarone, son of Giacomo Nucciarone and Maria Carmina Incoronata Colarusso, was born on August 10, 1889, at Frosolone, Italy. He married Mary Cardina, daughter of Giuseppe Cardegna and Lucia Maria Amoruso, on February 1, 1910 at St. Mary Catholic Church, Painesville, Lake County, Ohio. 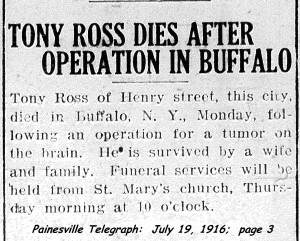 Antonio died on July 17, 1916, at Buffalo, New York, at age 26, after an operation to remove a brain tumor. His body was interred at St. Mary Cemetery at Painesville Township, Lake County, Ohio. 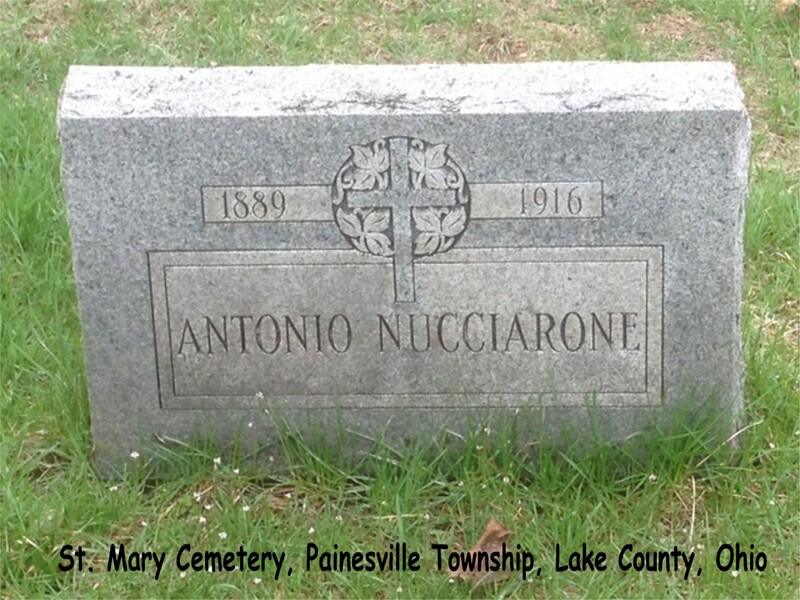 Antonio Nucciarone, age 13, immigrated to the United States on July 19, 1903, travelling to Painesville, Lake County, Ohio, joining his uncle, Nicandro Cardegna. He was travelling with his cousin, Michele Cardegna, and his uncle, Michele DeCesare. In 1914, Antonio’s half-brother, Carmine D’Alessandro, immigrated to the Unites States, travelling to Painesville, Ohio. 1. James Ross (Nucciarone) was born on July 10, 1910, at Painesville, Lake County, Ohio. James died on November 15, 1910, at Storrs Street, Painesville, Lake County, Ohio, of a strangulated hernia. 2. James Nucciarone was born on September 29, 1911, at Painesville, Lake County, Ohio. He married Edith Valocchi, daughter of Mattia Valocchi and Filomena Acciaso, on September 10, 1935 at St. Mary Catholic Church, Painesville, Lake County, Ohio. James died on May 17, 1971, at St. Vincent’s Charity Hospital, Cleveland, Cuyahoga County, Ohio, at age 59. His body was interred at Riverside Cemetery at Painesville, Lake County, Ohio. 3. Joseph Nucciarone was born on April 16, 1914, at Painesville, Lake County, Ohio. Joseph died on March 9, 1963, at Lake County Memorial Hospital, Painesville, Lake County, Ohio, at age 48. His body was interred at St. Mary Cemetery at Painesville Township, Lake County, Ohio. 4. 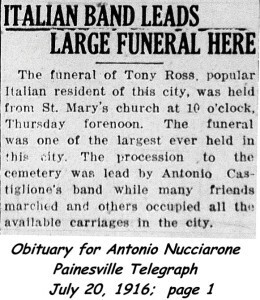 Toney Ross (Nucciarone) was born on May 27, 1916, at Ohio. 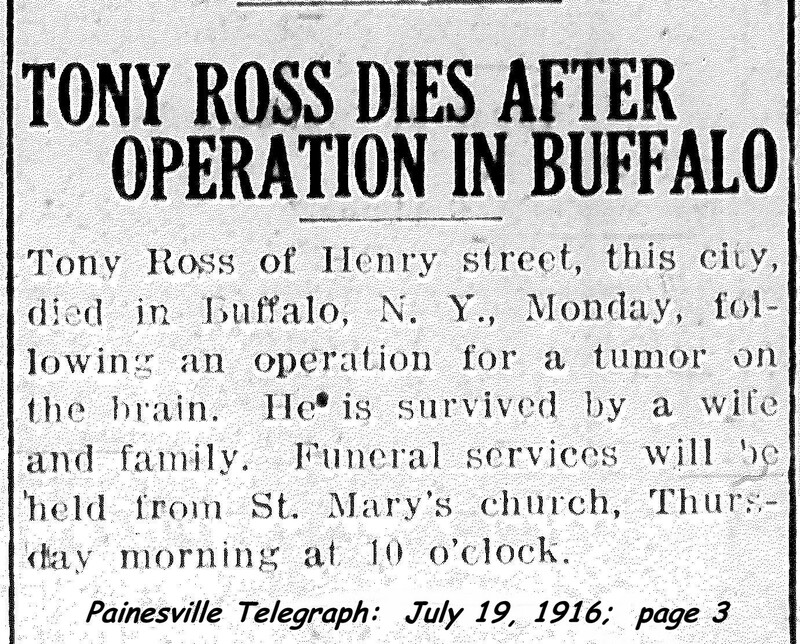 Toney died on August 17, 1916, at Painesville, Lake County, Ohio, of pneumonia. Toney was two months old when his father passed away, and died one month after his father.